Queriamos visitar novamente o Death Valley National Park e para isso passamos pela cidade de Lone Pine - onde existe uma reserva dos indios Paiute/Soshone e o Visitor Center na entrada do Death Valley National Park - onde se obtem toda a informacao sobre o trajeto, condicao das estradas e, principalmente, previsao dos minimos e maximos valores da temperatura, que ja atingiu 134 graus Farenheit (56.6 C) e a do solo chegou a 201 Farenheit!!! Este e considerado o lugar mais quente do mundo...O Death Valley e um deserto impressionante pela bela paisagem de dunas, montanhas e de variacao de elevacao. Aqui se encontra o ponto mais "baixo" dos Estados Unidos - 282 pes (86m) abaixo do nivel do mar e se localiza na Badwater Basin - uma bacia de puro sal branco resultado de um lago que se evaporou e deixou uma camada de sal de 30 pes de profundidade. O Parque e o maior de todos os Estados Unidos continental e possui aproximadamente 3.4 milhoes de acres com um eco sistema bastante diverso. Os primeiros residentes foram os indigenas e mais recentemente os Timbisha/Soshone. Os pioneiros durante a corrida do ouro (1849) em busca de um atalho para chegar a California acabaram passando por este local e se atribui a eles o nome dado - Death Valley. Aqui na regiao de Lone Pine devido a presenca da Sierra Nevada, do Death Valley, Amargosa Valley e Alabama Hills, foram filmados centenas de seriados e comerciais de TV e varios filmes, dentre eles westerns antigos e modernos, airon Man, Lone Ranger, Star Wars...perdi a conta... Entao aproveitamos a oportunidade para visitar o Lone Pine Film History Museum. Deste ponto tambem se pode avistar o ponto mais alto de Nevada - Mt. Whitney. We wanted to visit the Death Valley again and to do so we went through the town of Lone Pine, where there is a Paiute/Shoshone Indians reservation and where is located the Death Valley Visitor Center, at the entrance of the park. Here at the Visitor Center one gets all the information regarding the park as routes, road status, road work and, most important of all, the temperature forecast for the day - which has reached 134 degrees and the soil temperature has gone up to 201 degrees F...this is why this place is considered the hottest place in the world!!! Death Valley is an impressive desert, with incredible landscape with its dunes, hills, salt flats, and variations in elevation. Here in this desert is located the lowest spot in the US - 282 feet below sea level - at the Badwater Basin - a basin of pure white salt as a result of the drying of a lake which evaporated and left a 30 feet layer of salt. The Park is the biggest in the Continental US, and has aproximately 3.4 million acres bearing a very diverse eco-system. The first inhabitants were the ancient indian tribes and more recently the Timbisha/Soshone. 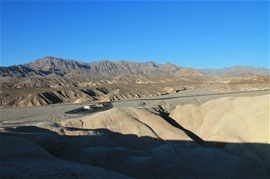 The pioneers arrived in this area during the Gold Rush (1849) looking for a short cut to get to California and passed through here and it is they who have called it "Death valley". Here in this region due to the presence of the Sierra Nevada, the Death Valley and Amargosa Valley and the Alabama Hills, there were several TV series and comercials, as well as movies which were shot here - from old westerns to the newer ones, Iron Man, The Lone Ranger, Star Wars...you name it...So, we took the opportunity to visit the Lone Pine Film History Museum. From here one can see Mt. Whitney - the highest peak in Nevada.